Most organizations struggle with attracting, retaining, and developing top talent. More and more organizations are implementing coaching programs in order to help employees reach their full potential and realize stronger business results. But coaching is fundamentally different from training. 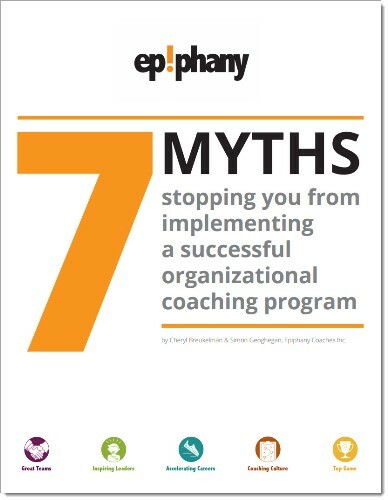 In this free guide, we address 7 myths and misconceptions that people have about coaching, and how they prevent organizations from getting maximum ROI from coaching. If you want to learn how to scale and measure your coaching programs effectively, then you’ll find our guide helpful. Get your copy of “7 Myths” now! I would like to receive occasional email updates about leadership development best practices. We are coaches who believe that improving business relationships can help solve business problems, generate new business ideas, and accelerate results. To date, we have coached thousands of leaders in over 70 countries and have implemented over eighty large scale coaching programs across a variety of organizations.